The iPhone Dev Team has released a minor update to Redsn0w jailbreak tool which will now report or notify you whenever a selected .png image file is invalid when using custom tethered boot logo option. Everything else mostly remains the same as the last release. Follow the instructions posted here to learn on how to quickly boot your tethered jailbroken iPhone, iPad or iPod touch on iOS 4.2.1 using Redsn0w. 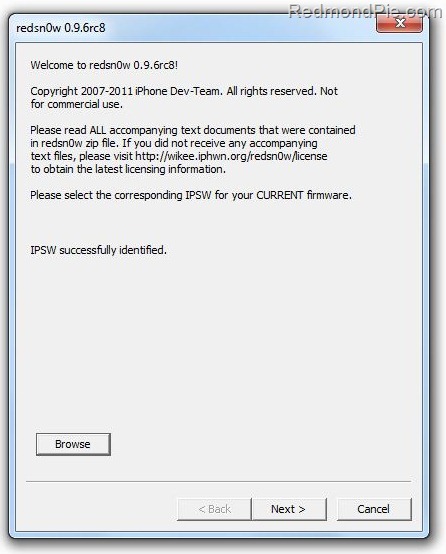 New to Redsn0w based iOS 4.2.1 jailbreak? Follow our step by step guide posted here to (tethered) jailbreak your iPhone, iPad or iPod touch on iOS 4.2.1 using Redsn0w 0.9.6, or here if you want untethered iOS 4.2.1 jailbreak on iPhone, iPad or iPod touch using Redsn0w 0.9.7. Available for both Windows and Mac, Redsn0w 0.9.6rc8 can be downloaded from the links given below.